As soon as Lady Dinah’s Cat Emporium opened in March 2014 we knew it was only a matter of time until we would be making a trek to Shoreditch. My older daughter is a true cat lady, displaying fascination going beyond her 12 years. You cannot just turn up on the day, we booked a table for 4 online 6 weeks in advance. From the outside Lady Dinah’s is a non-descript looking building on Bethnal Green Road. We arrive in plenty of time and spend several minutes watching a few of the sleeping cats through the very sticky window. As it happens my son is in town so we take him with us, thinking, one more chair at the table cannot possibly be a problem. It is. A clear and firmly stated problem. We are overbooked, we have rules, might have been possible on another day, blah blah blah. Disappointed, the four of us go to our table for 4 in the basement, my son goes off exploring the nearby Brick Lane market. I look around. Half of the tables are empty. The cats are all asleep in their respective beds, hammocks, and sofas. We take it all in, the towering scratch posts, the portraits of all resident cats with short descriptions of their habits, the box of cat toys, the bundles of bubble wrap on the floor. We order food and drinks.Two croissants, a cake, and a bagel. Coffees, orange juice and a jug of tap water. A few minutes later drinks arrive, and food for the 3 of us. My bagel has been lost in the process. So I request it again. It arrives some five minutes later with rather clumsy explanation. No tap water. After not allowing my son to join us and managing to lose my food order, there is not much that Lady Dinah’s staff can do right by us. Later on, things improve slightly. 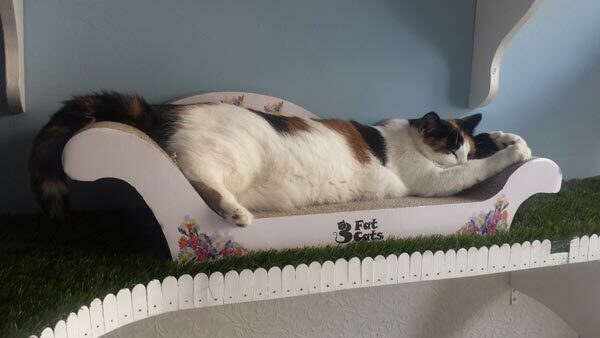 The majority of fat, clearly spoilt and pampered cats begin to stir. Some of them move from their good looking beds to window sills near ventilation pipes. It has to be said that the cats are really well groomed, with silky soft fur. By now my daughters are frantically trying to persuade the creatures to play with them, dangling various cat toys in front of them. 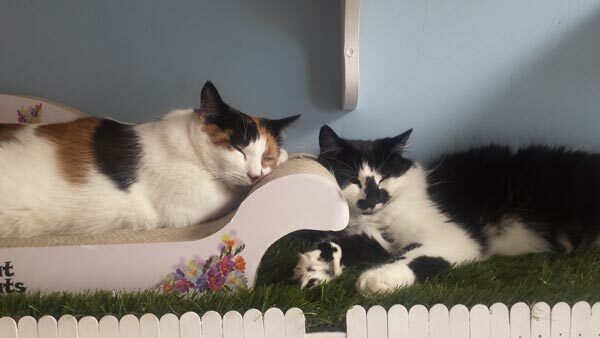 One or two staff members seem to come alive at the same time as the cats and begin to chat to us, introducing the cats’ personalities and talking about the cafe’s origins. The cats apparently come from a cat rescue charity Stepping Stones. One waitress (manager?) invites my girls to take a cat for a walk. My cat fanatic daughter takes a ginger beast to the front door on a leash. The cat seems unsure of stepping outside. After about an hour, out of the 90 minutes we have been allocated to enjoy the Emporium, my son suddenly becomes welcome, even though there now seems to be more people in the cafe than when we first got there. Whatever. I call him and he comes in. He is offered a drink, but no food. We are told that they are going to waive the £6 entry fee (!) in his case. I am speechless and shocked so I do not thank them. The last half hour seems to be progressively chaotic as more cats wander around majestically, chased by iPhones and one very professional-looking camera. When the bill comes, we are told, that because my bagel had taken so long to arrive, they are not going to charge us for it. This time I manage a weak thank you. We leave and embrace the newly regained freedom of the street outside. We enjoy breathing deeply again. 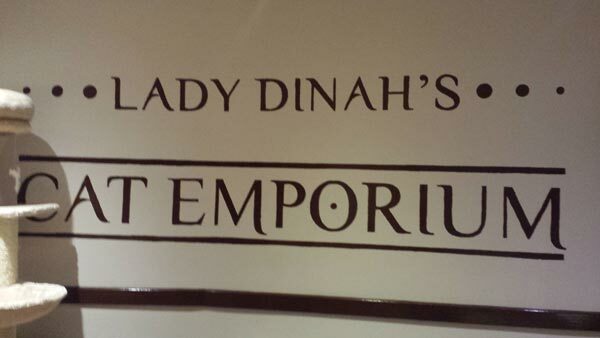 Lady Dinah’s is an amazing marketing and PR success story. The website manages to make your feel that, when you finally find an available slot on a distant date at the Emporium, you become privy to something really special. Unfortunately, the bubble bursts with a bang on arrival. The place is much smaller than expected. Hardly room to swing a cat in. Sorry, couldn’t resist. The ground floor cafe space feels a bit sterile and lacks character. I admit the ambience improves in the basement. The food is overpriced, but you expected it really, didn’t you, and it could have been worse. After all we are in the legendary Tower Hamlets. The £6 per person entry fee is however, seriously pushing it. The cats are asleep or lethargic for most of our visit, but hey, that’s cats for you, 11.30 in the morning is a tall order for a nocturnal species to be bouncing about. When they do wake up they treat us with aloofness and superiority their ancestors mastered millennia ago. We kind of expected this. What we didn’t expect was to be given the same treatment by our waitress. In summary, the cats are really trying their best here. They seem to have grasped the idea of this concept cafe pretty well. It is their human partners that have let them down. it is only fair that I should now let the cats speak for themselves, so that nobody is unduly influenced by one side of the story in making a decision whether Lady Dinah’s is worth a visit. Just one last thing. We never got our tap water.